It’s not always easy to consider our trials as joyful occurrences. It’s actually flat-out hard! When I first lost my husband, I couldn’t find much to be joyful about. Joy was certainly missing in my life at that time. 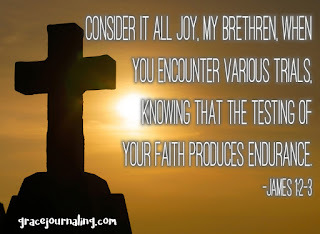 But Scripture tells us that we should be joyful in our trials because they produce endurance (also known as patience). The greatest joys often come through adversity. These trials strengthen us. They teach us endurance and patience. They refine us. Gold is refined through extreme heat. Faith is refined through trials and adversity. Our trials are many and are different for each of us. Satan likes to use our trials and adversities to try and deter us from fully trusting God. So, we have to put on the full armor of God because Satan will tempt us from all sides to lose our faith. Our faith is tried and strengthened through our trials. 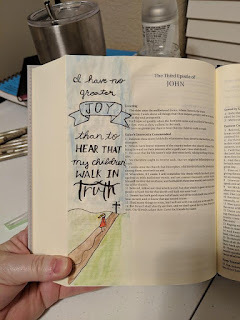 Instead of sinking into sadness or becoming desolate, we should endeavor to be joyful in all things We should be joyful because it is through our trials that we are being conformed into the likeness of Christ. When we react joyfully to adversity we strengthen our faith in God and further His Kingdom here on earth. In the midst of adversity, it is hard to be joyful. We get so caught up in our misery that we lose faith in You. Forgive me for the times when my faith slides to the wayside. Strengthen us and help us to be joyful in adversity. Help us to put on the full armor of the Lord so that we can fend off Satan’s attacks on our faith. Thank You for these trials, because we know that they are conforming us into the likeness of Your Son, Jesus Christ. Let our joyful reaction to trials be a light to the world, so that Your Kingdom is furthered here on earth.